As we consider water quality and land use across our state, every practice has its place. Which conservation practices and land use changes make the most sense where in terms of keeping soil in place? In terms of reducing nutrient export? In terms of building wildlife habitat? The Iowa Nutrient Reduction Strategy’s goals of 45% nitrogen and phosphorus load reductions will only be achieved through a broad suite of practices – including in-field management (reduced tillage, cover crops, and fine-tuned nutrient management) AND edge-of-field conservation practices. It’s an AND, not an OR! Farmers and landowners from Dallas and Polk Counties got to see and learn about edge-of-field conservation practices firsthand at last evening’s Iowa Learning Farms field day hosted by Dallas Center farmer Tim Minton. Located in the Walnut Creek Watershed, this area faces unique challenges being at the interface of productive agricultural lands and urban expansion. Walnut Creek Watershed is losing 430 acres of farmland each year to urban development, while clean, healthy waters are needed for an ever-growing population base. It’s all about finding the right practice for the right place. At just a 40% nitrate removal efficiency, this 5.7 ac wetland is equivalent to taking 567 acres of cropland out of production. PLUS the grasses and emergent vegetation provide wildlife habitat – it’s a definite magnet for waterfowl. It’s really beneficial for the ecology of the whole system! Every practice has its place, and we’ll continue showcasing these practices at field days and workshops across the state. 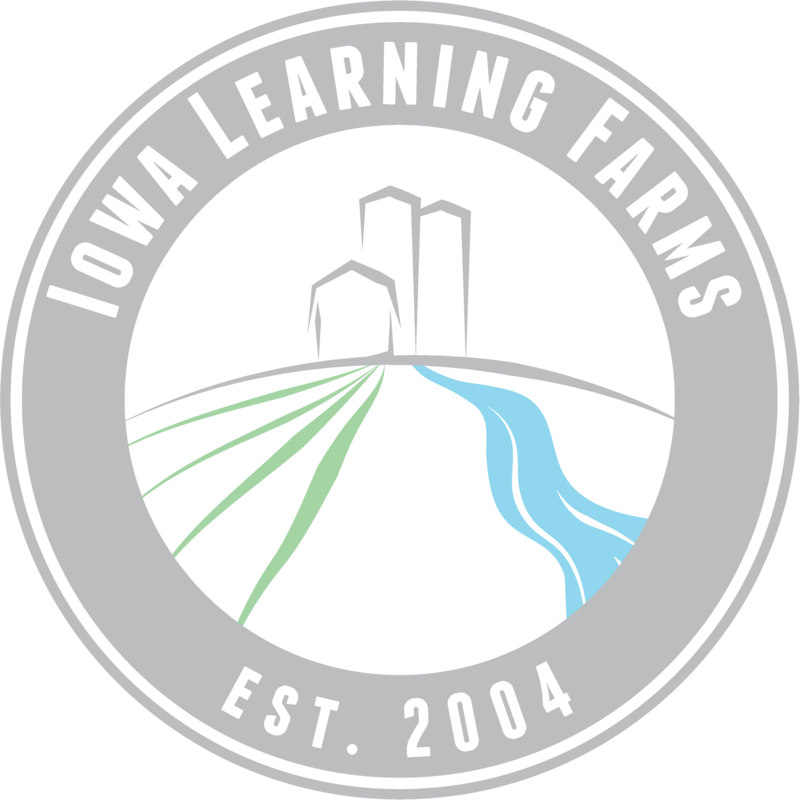 Contact Iowa Learning Farms if you’re interested in talking about edge-of-field conservation practices on your land! Learning about denitrifying bioreactors drew a good crowd of farmers and landowners from Central Iowa – and beyond – to the Iowa Learning Farms and Prairie Rivers of Iowa field day on Tuesday, July 17th. As a relatively new practice designed to reduce losses of nitrates from tile drained water, the crowd on Tuesday showed a high level of awareness and were eager to learn how bioreactors and other edge of field practices fit in to the Iowa Nutrient Reduction Strategy. Local landowner Joe Ruetter installed a bioreactor on his farm last fall and has been pleased with the results of reducing nitrate in his tile water. Joe also brought up that bioreactors are designed to address nitrate but don’t help with phosphorus so other conservation practices – like no-till and cover crops – are also needed to help reach our goals. Jace Klein, with Ecosystems Services Exchange, also emphasized the importance of utilizing the right practice in the right place. “All conservation practices have a place on the landscape. It’s a matter of fitting the right practice in the right location so as to maximize the efficiency and cost effectiveness of the practice,” stated Jace. In combination with the Conservation Station On The Edge demonstrating the science of denitrification, Jace pointed out the scope to which each practice is capable of treating. “If you have 40-120 acres next to a stream or creek, a saturated buffer would be the first practice we would explore. If that same sized field doesn’t outlet to a stream, then a bioreactor should be considered. However, if we are looking at multiple connections of tile draining much larger areas the most effective practice to consider would be a wetland,” explained Jace. By utilizing all the pieces of the puzzle – in-field and edge of field practices – the goals of reducing the losses of nitrogen and phosphorus from our landscape are possible. We have gathered many great resources about edge of field and in-field practices on our website: www.iowalearningfarms.org. You can also visit with your local NRCS office to determine which practices are best suited for your land and discuss cost share opportunities. Ben Johnson and his wife Amy. This month, host Jacqueline Comito has a conversation with a farmer in northeast Iowa. Ben Johnson is a sixth generation farmer that purchased his first farm with his brother Andy when he was a sophomore at Iowa State University. Conservation saves him one of his most valued resources on the farm: time. Johnson takes part in our Conservation Learning Lab program with a small scale watershed and CREP wetland on a neighbors property. He and his family began using cover crops in 2013, a year that had a terribly wet spring. They had 200-300 acres that were too wet to plant and didn’t want them to sit bare all year so they took an old seeder and ran oats and radishes that August. He noticed an improvement in the soil tilth right away and in the beans produced that fall. 2013 was also the year that they introduced strip-tilling, increasing water absorption and yield in those areas. Listen to this Episode of Conservation Chat to learn about the numerous benefits of strip-till, no-till and cover crops and how easy it can be to get started! You can subscribe to the podcast for future episodes as well.